Have you heard of Operation Scan Pyramids? This effort is authorized by the nation of Egypt who has partnered with institutions of higher learning and technology industries around the world. Their mission is to use 3D scanning technologies to solve the 4500 year old mysteries of the pyramids. Using high-tech tools like 3D scanners, infrared thermography and photogrammetry, it has been a work in progress for 12 months now. And now, finally, things are getting interesting. The latest findings have revealed two anomalies that researchers suspect could be two rooms, or “voids”, inside the Great Pyramid of Giza. Why does this matter? The main thing scientists want to know is how this Wonder of the Ancient World was constructed. Here we are nearly 5,000 years later with technology that can get a probe to Mars but a human being still can’t construct a pyramid. Conspiracy theorists would hope that such construction clues would link mankind to cosmic origins. However, it is more likely that more mundane explanations will be determined as to what these voids are. It is more likely that they are obstacles designed into the pyramid to prevent would-be invaders from successfully making their way to the burial chamber. With one void near the pyramid’s entrance, the gringa imagines some deadly booby-trap like an ancient guillotine or something of that sort tripped once an intruder crosses the threshold. The gringa awaits spellbound for the next revelation. The only advice I can offer is that if you decide to try to sneak a peek yourself, make sure that you’re wearing a helmet. Good Guy/Bad Guy – Who Needs ’em? The good guy/bad guy narrative is a literary classic. It seems rooted in religious beliefs of good and evil and non-religious esoteric beliefs of Yin & Yang. For every good guy there seems to be a universal need for a counterbalancing bad guy. Is this realistic? Is this necessary? The gringa would like to believe that bad guys and evil are simply obsolete. I mean, haven’t we reached that point yet in the evolution of humanity that we don’t need the contrast of the bad in order to recognize and appreciate what is good? And if we are basing our good guy/bad guy theory on ancient teachings that use real world examples of good and evil, what if those past histories are incorrect? After all, aren’t historical records always skewed according to the perspective of the author, whether they be the victor or the vanquished? Take, for example, one of the earliest examples of good guy/bad guy: Egypt and the ancient Israelites. According to the religious teachings of Judaism and Christianity, it is widely accepted that the Egyptians were the “bad guys”, enslaving the Hebrew people who were eventually chosen by God to be the “good guys”. However, historians and archaeologists who specialize in Egyptian history, not to mention Egyptians themselves, argue that this is an unfair depiction of the relationship between the ancient Egyptian empires and the surrounding less powerful nations and peoples. Can science and historians reveal the truth? David Wolpe is a rabbinical scholar who argues that archaeological evidence simply does not support the biblical notion that ancient Egypt practiced widespread enslavement of the Hebrew people, or any people for that matter. But just because evidence hasn’t been found doesn’t mean that it doesn’t exist. So let’s look at the historical facts that are known and the science of archaeology to understand these facts. 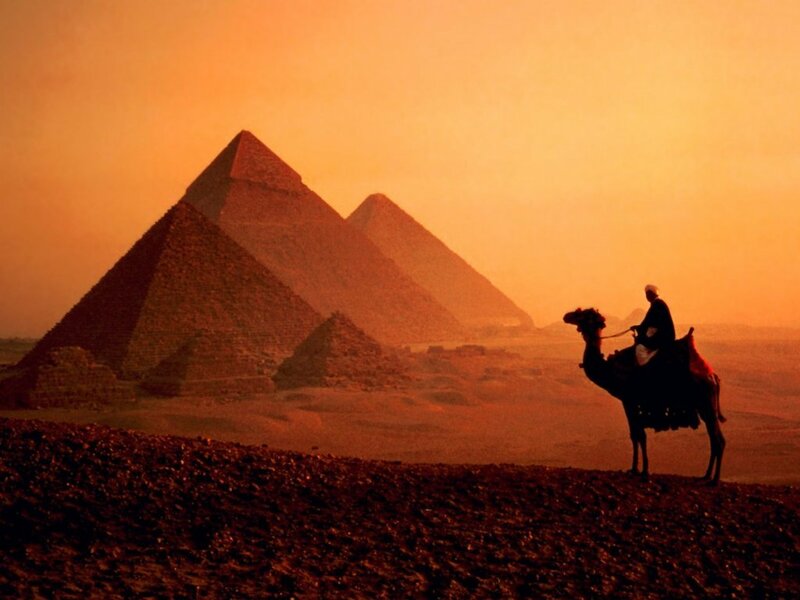 Before their enslavement, the Hebrew people migrated to Egypt to survive a famine. The biblical record maintains that they were there for several generations. There is basically a 300 year gap between the appearance of the Joseph story and Moses. The earliest possible date suggested by the Jewish and Christian religious texts for the enslavement of the Hebrew people by Egypt would have been 1400 B.C., in other words, about 300 years after the era of the pyramids. So what was going on in Egypt from 1700 B.C. to 1400 B.C.? Why would Egypt need widespread enslavement if the grand monuments had already been constructed? Egypt’s 14th Dynasty ruled anywhere from 1725-1650 B.C. or 1805-1650 B.C. depending on which historian you talk to. Regardless, this would have been the dynasty in power when Jewish and Christian texts claim that Joseph took his family to Egypt in order to survive the region’s famine. His family would grow to become the Hebrew people. Does the known history and archaeological science support that a famine occurred in the region during this time? What kind of science might be used to find out? Interestingly enough, an examination of pollen buried deeply in Egyptian soil around the Nile reveals that a devastating drought occurred at this time in history. This region was dependent upon the annual floods of the Nile Delta to enrich their agricultural lands. A drought would have, indeed, resulted in a famine. So what would life have been like as an immigrant in an ancient Egyptian kingdom? Archaeology reveals that rulers during the 14th dynasty had names that indicated Canaanite or Western Semitic origins, with one king and queen with Nubian names. So, it seems that at this time Egypt was an ethnically mixed bag. These kings and queens would be involved in conflicts with neighboring rivals to control the strategic area of the fertile Nile Delta. Control the agriculture, control the food. Eventually a prolonged period of famine and disease weakened the kingdom which then fell to a takeover by the Hyksos. The Hyksos takeover would have occurred after the suggested time of the Hebrew Exodus story. Yakbim Sekhaenre (contested): 1805 B.C. – 1780 B.C. Ya’ammu Nubwoserre (contested): 1780 B.C. – 1770 B.C. Qareh Khawoserre (contested): 1770 B.C. – 1760 B.C. Ammu Ahotepre (contested): 1760 B.C. – 1745 B.C. Sheshi Maaibre (contested): 1745 B.C. – 1705 B.C. Nehesy Aasehre (uncontested): 1705 B.C., name means “The Nubian” inscribed on 2 known monuments. Sewadjkare III (uncontested): 1698 B.C. After this there is a list of names established as Egyptian kings of the 14th Dynasty but without designated dates for their reigns. What do we know about these kings and the conditions of their kingdoms that might have any affect on the good guy/bad guy designations in the Jewish and Christian religious texts? Majority of the cartouches excavated refer to each reigning king as “son of Ra” in addition to whatever the king’s individual name was. During Sheshi’s reign 1745-1705 B.C., seals with his provenance have been discovered in archaeological digs in Egypt, Nubia and Canaan suggesting that his kingdom enjoyed widespread trade and relations outside the immediate borders of Egypt. Some scholars believe this to be the Sheshai mentioned in Jewish and Christian religious texts as being of the Anakim of Hebron when the Hebrews conquered the land of Canaan. If Sheshi had good trade relations with the people of Canaan and was the ruler of Egypt when the Hebrew people conquered Canaan, it would only be natural that Egypt might then take a posture of hostility toward the Hebrew people. It is then possible that the ancient Hebrew people were not victims of the ancient Egyptians. They may have been viewed as nomadic invaders who disrupted trade with allies. It reminds the gringa of European history and stories of Viking raiders. The Hebrew people also practiced a foreign religion that was monotheistic. It is easy to see even today how religion can play a big part in hostilities between cultures that can lead up to oppression and even war. I mean, think about it. The Hebrew people first show up needing a place to survive a famine. Egypt graciously takes them in. Then, after weathering the storm, growing fat and happy as well as increasing in population and herds who need grazing land, the Hebrews, within one generation, rise up and attack a trade ally, Canaan, a rich land for Hebrew herds of sheep and goats. The Hebrew people take over the nation by slaughtering, according to the biblical account, every man, woman and child because God “told them so”. The gringa can imagine the horror of Egypt at these actions. I can also understand how the polytheistic Egyptians would decide that the single God of the Hebrews was a backstabbing baby-killer. No suprise then, that there would be no love loss between Egyptians and Hebrews that continued to live together in Egypt. Hebrews were probably eyed suspiciously and discriminated against, though probably not enslaved. These resentments, deep in the heart of the Egyptians who saw their trade allies vanquished by people they considered to be dangerous heretics, would have most likely been an attitude that would have been passed down for generations. Just as politicians have used such emotions and history to stir up support for their cause throughout my own country’s history, the gringa thinks it is very possible the same type of politics were at play when it came time for the Hebrew people to rise up, claim oppression, revolt and march out of town. They just seemed to forget that they started it all. The natural result would be for the Hebrew people to villainize Egypt, victimize themselves, then paint a heroic picture of their escape to inspire their own people and motivate them for noble purposes. On the other hand, the ancient Egyptians would have historians creating records for the pleasure of their rulers. They would depict their nation as benevolent and tolerant. Factions such as the immigrant, nomadic, heretical Hebrews would be painted as radical rebels stirring up unrest and not wanting to work. So, in the end, the gringa does believe that, much as I would like to think that humanity has evolved to the point where we no longer need the good guy/bad guy narrative because people know better now, that’s simply not the case. As long as we have politicians who have something to gain by exploiting the differences in groups of people, we will always have the good guy/bad guy narrative. But it is a human creation, not a spiritual reality. And for kids who adore science as much as they adore truth, the science involved in archaeology can help resolve many divisive differences that exist today because of politicized religious teachings of yesterday. Become an archaeologist and change the world. Posted on August 22, 2016 August 17, 2016 Categories Adolescent, agriculture, archaeology, Art, christ, christian, class warfare, culture, Discriminate, discrimination, Diversity, dominion, Education, Egypt, emigrate, Ethnic, Ethnicity, famine, immigrant, Judaism, politics, prejudice, pyramid, Religion, Science, technology, theology, UncategorizedTags aasehre, agriculture, ahotepre, anakim, ancient, archaeologist, archaeology, bible, biblical, canaan, cartouche, christ, christian, dynasty, Egypt, esoteric, europe, evil, famine, God, hebrew, hebron, heresy, heretic, historian, historic, histories, history, hyksos, Israel, Jew, judaism, khakherewre, maaibre, merdjefare, migrate, moses, nebdjefare, nebefawre, nehesy, nile, nubia, nubwoserre, pollen, pyramid, ra, rabbi, religion, religious, scholar, science, scientist, sehebre, sekhaenre, semite, semitic, sewadjkare, sheshai, sheshi, slave, viking, wolpe, yakbim1 Comment on Good Guy/Bad Guy – Who Needs ’em? Do the gringa’s dear readers remember Sam, the big ball hunter of Bosnia? Well, the gringa found the subject of ancient big balls so fascinating, she continued to do a bit of digging around (pardon the pun) in Sam’s archaeological projects. Ol’ Sam, aka Semir Osmanagic, seems to have made quite a notorious name for himself in the scientific community where geometric relics are concerned. The Indiana Jones of the Balkans has also claimed to have discovered pyramids in Bosnia. First reported shortly after his announcement of his discovery in 2001, serious archaeologists where quick to label his find nothing short of buffoonery. Sam, true to form, soldiered on despite his naysayers. He is fully convinced he has discovered Europe’s first ancient pyramids and it begins with Bosnia’s Visocica hill that lies close to Visoko, a Bosnian town almost twenty miles northwest of Sarajevo. Visoko was once the capital of Bosnia during medieval times. Roman and Illyrian ruins can be found nearby as well as Neolithic relics. Perhaps, then, thousands of years ago, it was a thriving capital city noted by architecture similar to ancient Egypt. Dubbed by Sam as the “Bosnian Pyramid of the Sun”, excavation began in an official project in 2006. On hand, in addition to Sam’s international archaeological team, were tourists, curious locals, journalists and, interestingly enough, beauty contestants from the Miss Bosnia pageant. As days and weeks passed, volunteers and crew members removed enough earth to reveal what they claim to be a system of tunnels. Sam reported the tunnels to be constructed of sandstone blocks and man-made mortar. His best estimate on the age of the pyramid and tunnel network is around 2,500 years old. The project had not discovered any bones, pottery, charcoal or other artifacts that might have been linked to any ancient Bosnian civilization. As tourism to the site increased, Sam increased the size of the site for visitors to explore. Other hills were soon named: Pyramid of the Moon, Pyramid of the Earth, Pyramid of Love and Pyramid of the Dragon. Locals say business is booming with cash laden tourists buying all sorts of souvenirs, eating at the cafes, and staying overnight at the town’s inns. How fortunate for a region that has struggled to recover from the brutalities of the 1990s. Sam thinks this positive turn of events is just what Bosnians not only need, but also deserve after enduring such suffering. Sam recognizes that the number of archaeologists that scoff at his discovery is legion. Some have even attempted to get his dig shut down. Others worry about how it will harm the integrity of “real” archaeology. Then there are those who worry that there may be true historical value to be studied in the area but that Sam’s “wacky” pyramid scheme could inadvertently destroy the evidence as he focuses on “creating” ancient pyramids. The press has given him mixed reviews. Among those getting on the Bosnian bandwagon are ABC, Associated Press, Boston Globe, MSNBC, and the Washington Post. Archaeology magazine, however, criticized the press for being gullible. Mark Rose, the editor, attempted to smear Sam’s reputation by poking fun of his claim that Mayans could have been the ancestors of the mysterious Atlantis civilization. Now, the gringa has seen theories bandied about regarding this and language is usually the link. That is a possibility I could find plausible. Despite all of this, Sam remains standing strong against the haters and insists that the pyramids are, indeed, quite real. The Bosnian government also supports him completely and in 2011 gave permission for Sam to thoroughly investigate the hills/pyramids. Their reasoning is that they expect archaeologists to criticize Sam’s discovery. To accept Bosnian pyramids, they have to reject what they have been taught as traditional history. That is a bitter pill many will find too hard to swallow. The gringa understands. Traditional history attests that 2,500 years ago ancient Bosnians were living in tents or caves and cooking by campfire. Evidence to this effect has been found in ancient tools discovered in exploration of caves and suspected settlement areas. To claim that man-made monuments on the scale of pyramids were being built just seems outrageous. Sam knows he must deliver extraordinary evidence to change the minds of skeptics. The gringa needs to understand the evidence that is available. As excavation progressed, the “hill” took on the shape of a stepped pyramid. Many geologists, archaeologists and scientists of related studies conducted their own examination of the site. They concluded that the shape of the hill is naturally occurring, despite its resemblance to a stepped pyramid. The formation is called a flatiron formation. The European Association of Archaeologists went a step further and published a press release claiming the whole thing is a hoax perpetrated for financial and political gain. In direct contradiction to these scientific professionals are others who have thrown in their support of Sam’s pyramid scheme. The Geodetic Institute, located in Sarajevo, sent out a surveyor. His measurements reported that the Pyramid of the Moon is a step pyramid with three triangular sides and a flat top. The sides are oriented toward cardinals points making it highly unlikely this is an accidental occurrence of nature. When satellite images were thermally analyzed, they determined that the pyramid structures’ pattern of heat loss showed that it occurred more rapidly than the surrounding natural hills. This gave way to the theory that the hills suspected to be pyramids are man-made and containing voids such as chambers and access tunnels. Sam theorizes that ancient Illyrians constructed the pyramids between 12,000 – 500 BC and construction could have been ongoing over a period of time spanning multiple cultures and civilizations. A tunnel system spanning over two miles connects the three main pyramids. Sea levels would have been 1,500 feet lower than today so, although the tunnels contain water now, they would have been high and dry thousands of years ago. During medieval times, a fortress sat atop Visocica. Experts who stand firm as Sam’s critics claim the ruins he is excavating actually belong to this ancient Roman observation post. The gringa leans more toward this theory than an ancient pyramid considering the purported age of the pyramid. If the pyramid was constructed between 12,000-500 BC, this part of Europe would have been covered by a sheet of ice almost one mile thick. Where would they get the stones? If they found the stones and required ingredients for mortar, how would they have been able to make the foundation stones connect with the earth? They would need to excavate nearly one mile of ice over a span of several square miles to construct multiple pyramids. Then they would have to dig a tunnel system into a frozen earth. Now, I understand the desire for fame and glory. The gringa also understands the desire for a people, impoverished by years of civil war, to take advantage of a profitable project. I’m not convinced these are genuine, man-made pyramids that are thousands of years old. I do think they are newly man-made pyramids constructed atop ancient Roman ruins. And even though archaeological purists would scream at just how wrong that is, the gringa once again shrugs and says, “What’s done is done.” Now I’m more concerned with the humanity factor of the locals who are alive today. They would like to eat well, live comfortably and have the means to educate their children. If a crazy pyramid scheme can do all that and everyone is aware of the controversy, who cares? It can only be a hoax if the criticisms are suppressed. As long as they are openly published, it is buyer beware. Everyone is free to believe what they want to believe. And I still like Sam even if he is off his nut. If man is really an intelligent animal it would stand to reason that he would learn from his own mistakes. If he is an extremely intelligent animal he would also learn from the mistakes of others and the mistakes demonstrated in the annals of history. So, how smart are we, really? The gringa’s thinkin’, um, maybe not so smart. As NASA and other space agencies throughout the world use their technologies to create models of what to expect from climate change, they have continued to share their knowledge with the world. Some folks are listening, others are not. Some folks are taking action, others are not. Of those taking action, it just doesn’t seem like their efforts are enough on their own. And considering what the world’s top scientists are warning everyone about, the gringa’s only conclusion is that, as a whole, man’s just not the sharpest pencil in the box. And that’s just a few, not to mention basic food crops like grains that the entire world is dependent on and requires vast amounts of fresh water for cultivation. So what happens when vital industries collapse? How can the effect upon society be known? Won’t some very clever entrepreneur simply come up with a suitable alternative to replace what collapsed, using a completely novel material? Well, that’s not what history teaches us. Throughout history many great nations and empires have collapsed due to some significant event that led to the decline of the population and their economy. The pattern reflects that such collapses of empires is usually preceded by a culture that becomes obsessed with accumulating wealth at the price of oppressing the poorer working classes. Once this becomes the societal norm the culture has become a predator vs. prey culture. It seems pretty obvious to the gringa that, at least in her own country, the United States, this is the current state of things. So, if my nation has evolved into the cultural stage that precedes a collapse of the state system, is there anything that can be done to prevent the collapse or are we too far gone? Experts say that the condition is possibly reversible if the culture will do one very important thing: Reduce consumption to a sustainable level and distribute resources more equitably. This solution sounds pretty simple for a highly complex problem and civilization. How in the heck do these experts expect Americans to change their consumer culture? Their consumer culture is EXACTLY what defines them. Americans are not proud of a heritage of literature or fine art or musical progenies who produce operas. Americans are proud inventors and innovators and entrepreneurs who sell lots of goods and services in order to make lots of money so they can turn around and buy lots of goods and services to serve as the evidence that they were successful to begin with by their own selling of goods and services. The gringa believes the United States is doomed because the very actions they believe has made the country great is the very behavior that is going to bring it down. Gross consumerism. So, if America is doomed to collapse, then what will happen? Well, when the Roman Empire bit the dust centuries followed where the population declined. Sick folks couldn’t afford medical treatment so death rates were higher. Young people had uncertain futures so there were fewer pregnancies. What pregnancies there were experienced higher infant mortality because diets were poorer and medical treatment less accessible. The Romans also became dumber because education takes a back seat as a priority when a person is trying to eke out an existence in a collapsed empire. In fact, the population of Rome became widely illiterate. Let’s stop there and note that the Mayans had reached a point in their society where they were ruled by kings. Their science and astronomy was highly advanced. Metallurgists and craftsmen created magnificent art and jewelry. And then this highly ordered civilization with their kings and calendars and sophisticated political system and complex culture lost well over 90% of their population. This cycle of rise to power, period of indulgence then collapse into dissolution is worldwide. It has occurred in virtually every major civilization on every continent in the world. No people has been immune. And each civilization was arrogant enough to believe that they would be the exception to the historical rule. Much like my own nation. Well, pretty much everything on the list has either happened or seems rather imminent. So now what happens in the predator vs. prey model of America? Well, as the predator becomes more and more enriched, they begin to outgrow the available prey population. The population of the prey will continue to decline. The predator will then have to turn elsewhere to have their needs met. That can be done by creating wars for profit in other countries, assisting in regime changes to place in power a leader who is friendly and will allow exploitation of their people and natural resources, and trade agreements with friendly nations that openly exploit their natural resources and population. Yes, that is America. But the bad news is that when a predator population begins to rage out of control and threatens the natural order of things, it also begins to decline with disease from growing fat with overfeeding. It then declines even more as it becomes malnourished due to a decline in available prey caused by its gross overfeeding. And then, finally, the predator weakens to the point that it can no longer regain its strength and former glory and a greater and stronger predator swoops in and takes out the competition. And this little rabbit is watching and seeing everything that the wolves are doing.